In the early afternoon this date, Equatorial Guinea’s former President for Life was sentenced to death with six aides at the end of a four-day trial for murder, treason, embezzlement, and genocide. That evening, the seven were shot at Malabo’s Blabich Prison. Nguema Biyoto Masie, nee Francisco Macías Nguema, rose from the Spanish colonial bureaucracy to win the first post-independence presidency of the minuscule African state. He quickly created a one-party state and increasingly nutty cult of personality, answering to such horror-comic nicknames as “Unique Miracle”. His nephew, Teodoro Obiang Nguema Mbasogo, overthrew him a few weeks before this date. Despite the speedy resolution of the case, international observers on the scene considered it a fair enough trial and the dictator’s guilt duly established; procedurally, the execution happened immediately because he was tried by the highest court in the land and there was nowhere to appeal. 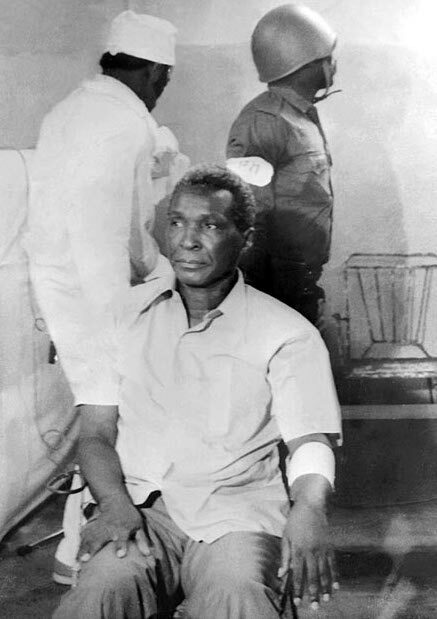 Francisco Macias Nguema during his trial. Still, the shooting itself was handled by hired Moroccan troops, rather than citizens of Equatorial Guinea: Nguema had convinced quite a lot of people that he had magic powers, and the locals weren’t eager to be the ones to test the proposition. Bloody but necessary first step to parliamentary democracy? Not quite. 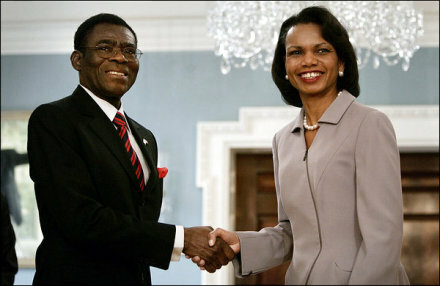 Teodoro Obiang Nguema Mbasogo, one of the worst dictators you’ve never heard of, still runs Equatorial Guinea in much the manner of his predecessor to this day. Did we mention that Equatorial Guinea has oil? * Francisco Macias Nguema’s daughter, “Empress Bella Syttam Macias”, lives in Utah and defends her dad. She seems to have been too young to have been personally involved in anything unsavory in the 70’s.